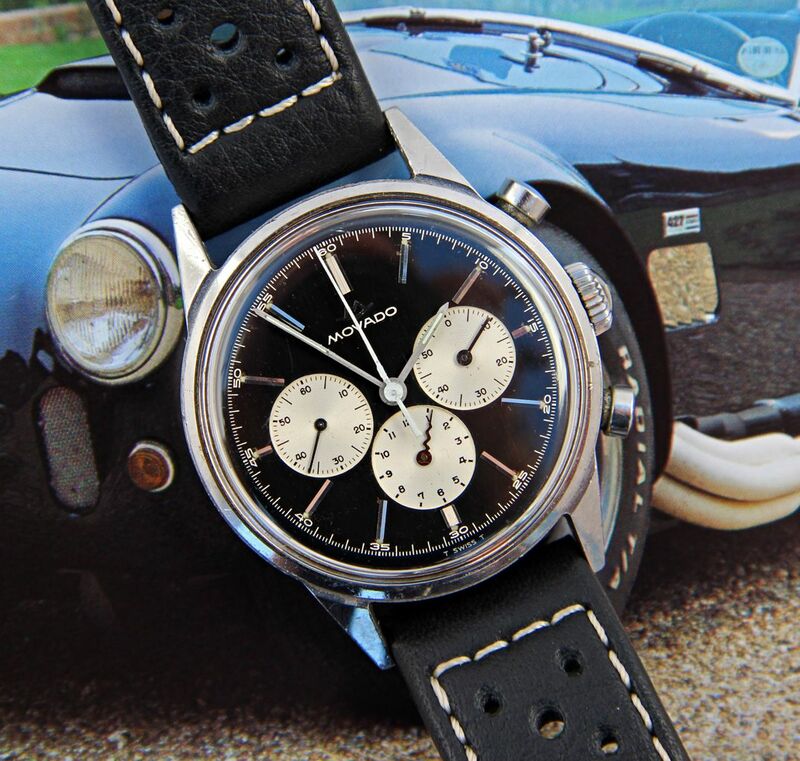 Up for sale is this rare and beautiful 1960s Movado Inverse Panda chronograph with the famed in-house caliber 95M. 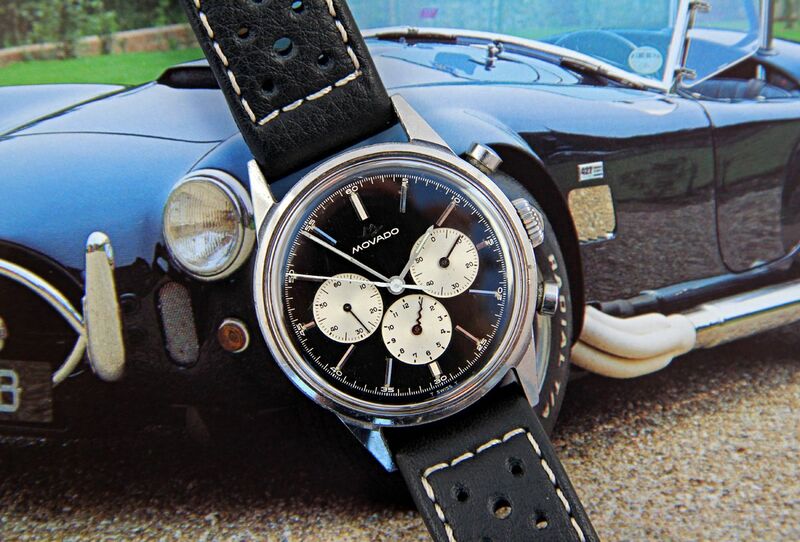 This unique chronograph movement was one of Movado's last in-house calibers before being pretty much absorbed by Zenith and turned into essentially a subsidiary brand. It operates in a funky "upside down" manner, with the bottom pusher starting & stopping the timer and the top pusher resetting it, likely due to its innovative modular design. Also unusual is that the minute counter is calibrated for a full 60 minutes as opposed to the more common 30-minute register found on most chronos. 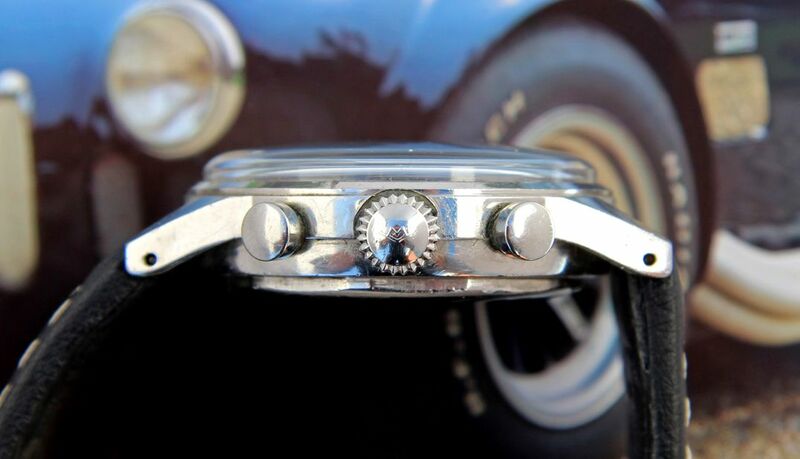 Further adding to this watch’s allure is the all-stainless steel screwed case, which features an inner anti-magnetic dust cover, and was manufactured by FB (Francois Borgel/Taubert & Fils) who also manufactured water resistant cases for Patek Phillipe, Vacheron and Mido among others. 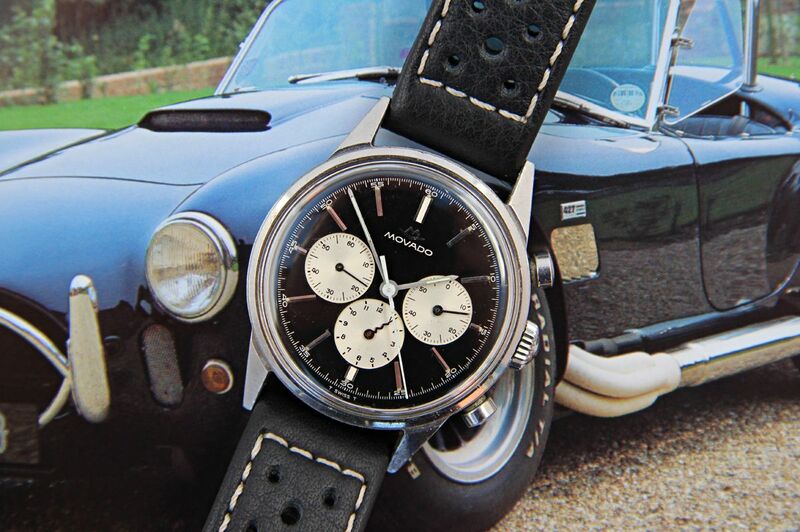 And of course the pièce de la résistance is the stunning black dial with contrasting white registers, aka Inverse Panda, one of the most sought after chronograph layouts in vintage watches. Better yet, this dial is Near Mint and all original. 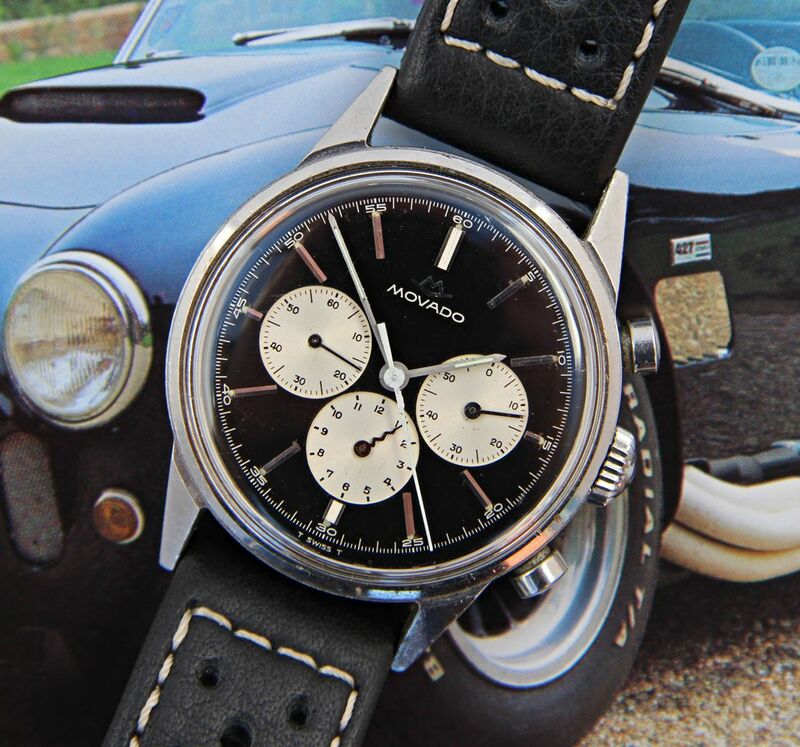 Overall, this classic Movado chrono is in Excellent vintage condition with a stunning Near Mint Inverse Panda dial and a case with some wear but that shows little if any polish. And since it was serviced relatively recently by my NYC Master Watchmaker and is operating beautifully it is ready for years’ more faithful service for its lucky new owner. I will also guarantee the movement for 6 months of normal non-abusive use. 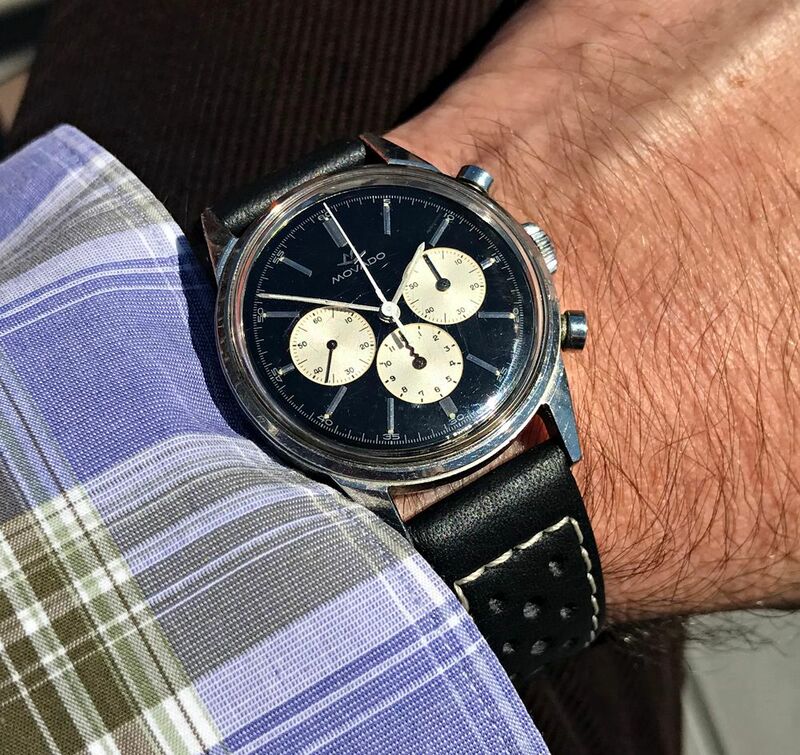 The asking price for this hard-to-find steel Movado Inverse Panda 95M chronograph is $7,450 USD OBRO, including fully insured FedEx shipping worldwide. Bank Wire greatly preferred on this watch. Other payment options upon application. Payment must be made in US DOLLARS. Watch will ship upon full clearance of the funds, as well as any necessary bank vetting. CASE & BACK: Classic and elegant 35mm wide (not including crown) x 44mm long x 11mm tall all stainless steel 2-piece screwed case with faceted lugs and stepped bezel. The case shows little if any polish with sharp edges and undistorted lug holes. 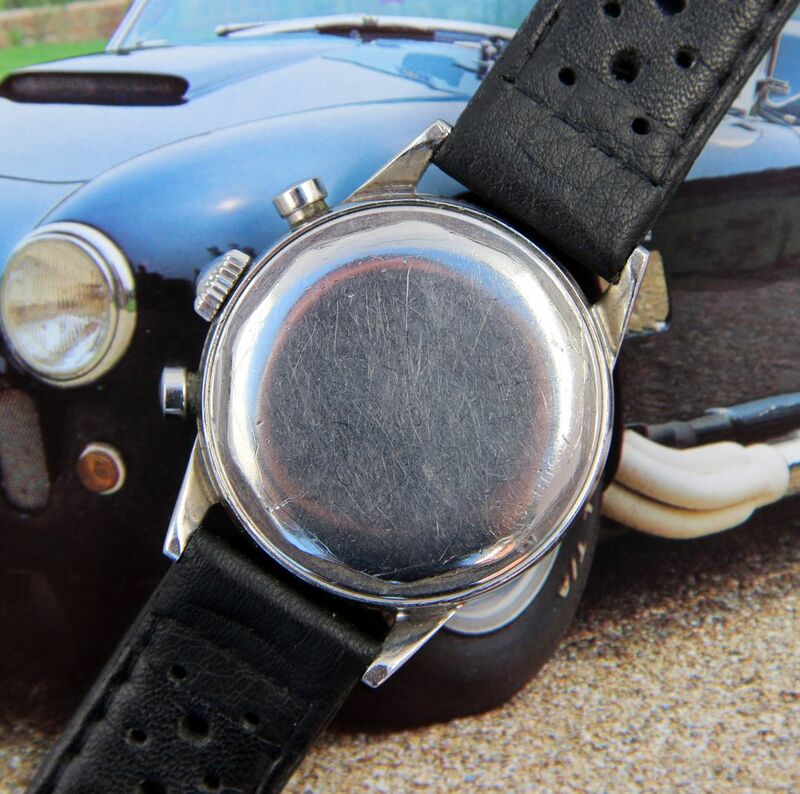 It exhibits typical wear for a 50+year-old watch that has been worn regularly with many superficial scratches and one or two nicks but no serious dings — Excellent and probably unpolished condition overall. The outer part of the dedication-free screw-in caseback also shows superficial scratches and one or two deeper marks to the polygon facets from poor opening technique — Very Good cosmetic condition and the “SUB-SEA” stamp is worn but visible. 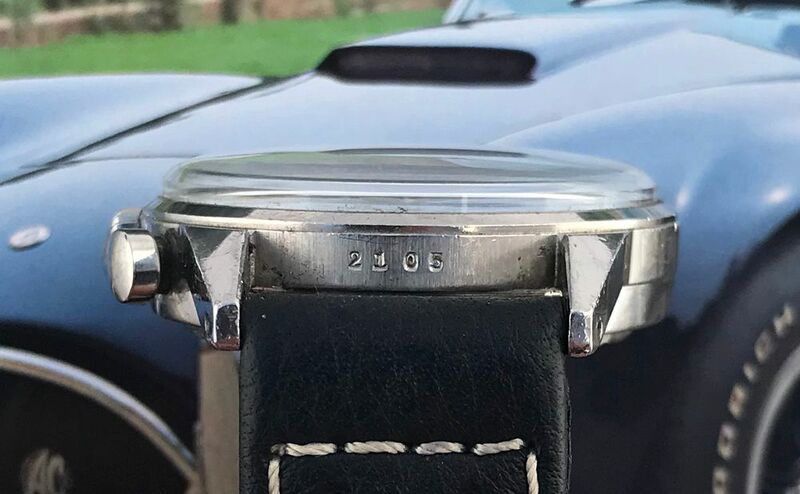 The inner back and the back of the case have no significant corrosion and the inner caseback has all the correct Movado brand, model and FB case maker hallmarks of the period. The movement is protected by an anti-magnetic dust cover, which is present and a really cool military-like feature. Also, the four numbers between the lugs match those inside the back, which they definitely should. DIAL & HANDS: All-original beautiful glossy black Inverse Panda dial with applied Movado logo, white engine turned sub-registers & silver minute track is Near Mint. There are only some minor signs of age to the sub-dials, which have acquired a handsome ivory tone, and some small areas of galvanic reaction around the luminous plots that keep this awesome dial from being absolutely Mint. Original Tritium luminous plots are intact and will glow briefly when exposed to UV light. Original hour & minute hands appear to have had their slim luminous fill stabilized, as there are only faint sparks of luminescence, and the sweep seconds chrono hand also looks to have been repainted at its base. 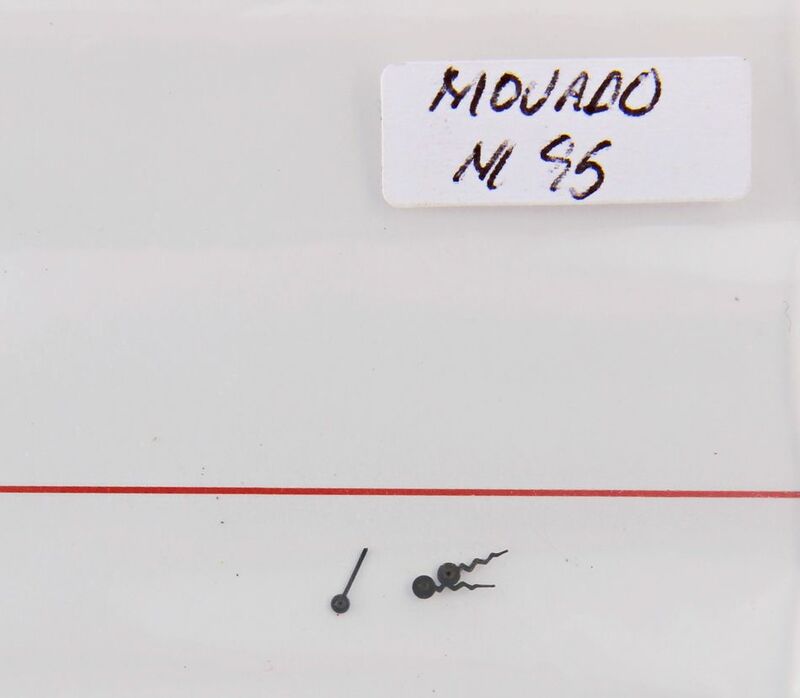 The characteristic Movado “serpent” or “kris” subdial hand is present on the hour recorder but the minute counter hand is of a standard/straight design so probably replaced at some point (the constant seconds is always standard regardless). However, I am including a complete 95M “kris” handset which I never got around to installing at no extra charge! 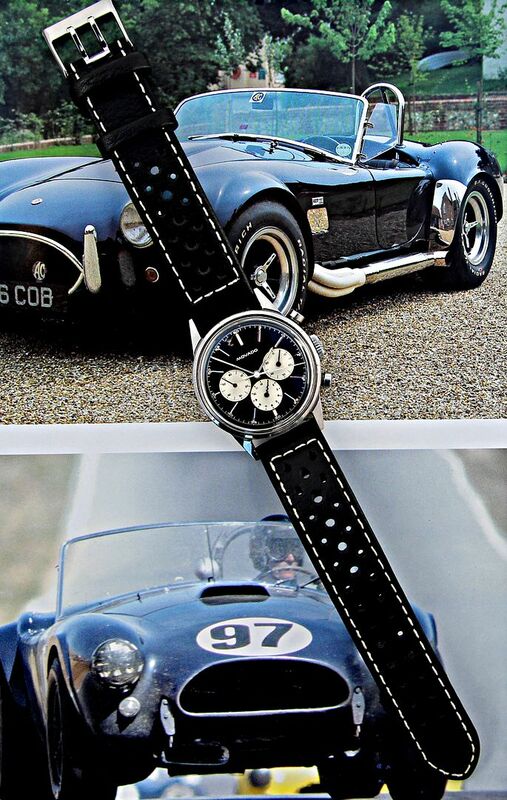 On the wrist or on display this inverted Panda layout is absolutely stunning and elegant — a real gentleman’s chrono. MOVEMENT: Famed in-house Movado caliber 95M modular chronograph movement, one of the first modular chrono constructions and definitely one of the all-time greats. Some watchmaker of the past has inexplicably made some small notations on the distinctive kidney-shaped bridge but the nicely finished 17-jewel movement is otherwise looking very bright and clean. 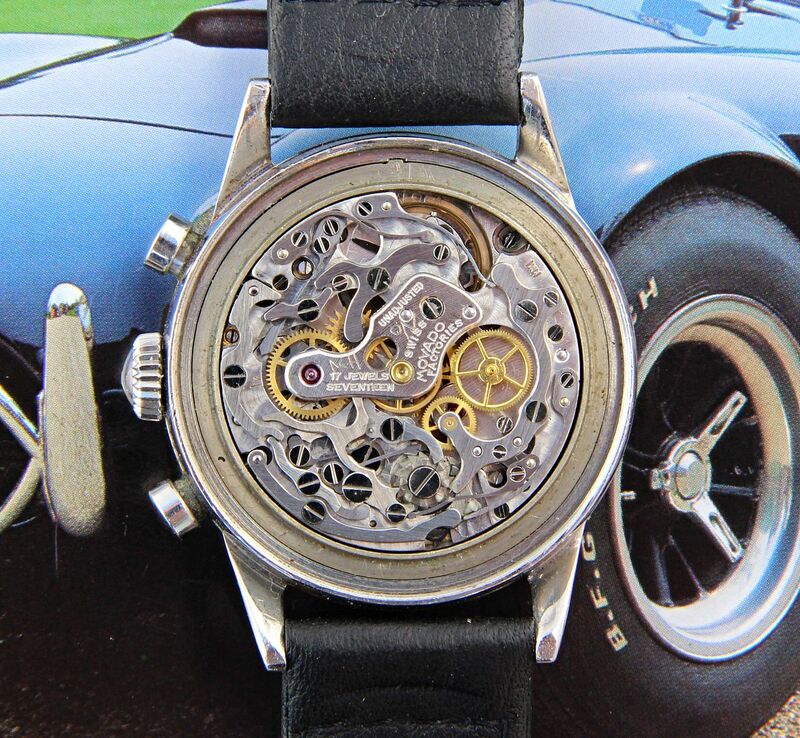 This fine and complex movement was fully serviced by my watchmaker in 2016 so of course it runs as it should, with strong power reserve, precision operation & reset of all chronograph features and with all time-setting and winding aspects working well. Therefore I am willing to guarantee the movement for 6 months of normal, non-abusive use. 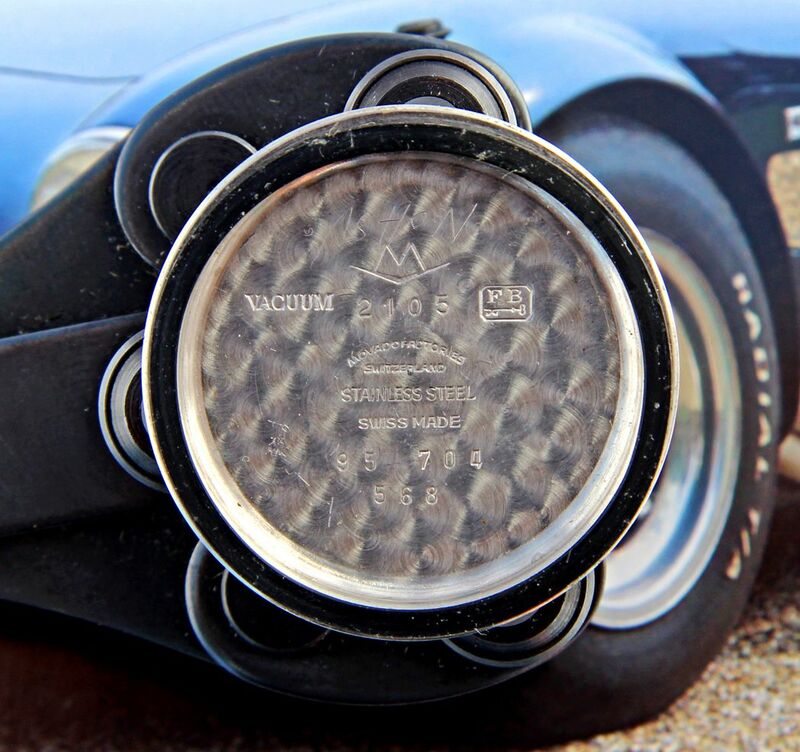 CROWN & PUSHERS: Original oversized "mushroom"-type crown signed with the Movado logo and plain pushers are in Excellent condition with only minor wear. 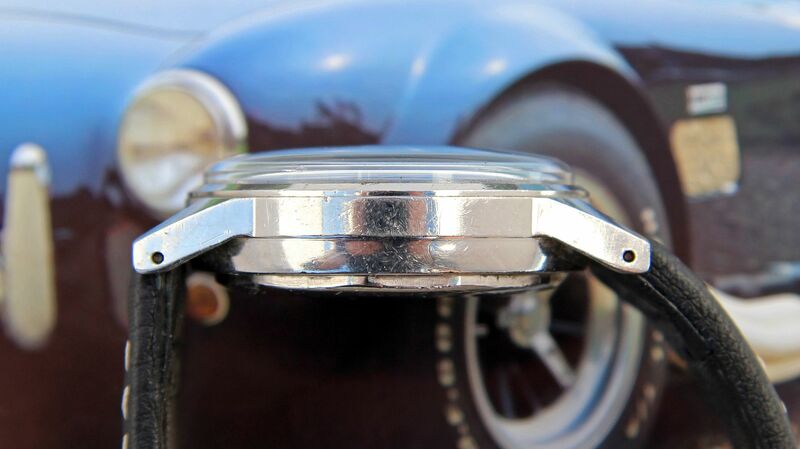 The push-in crown sits flush to the case, winds the movement and sets the time when pulled out as designed. 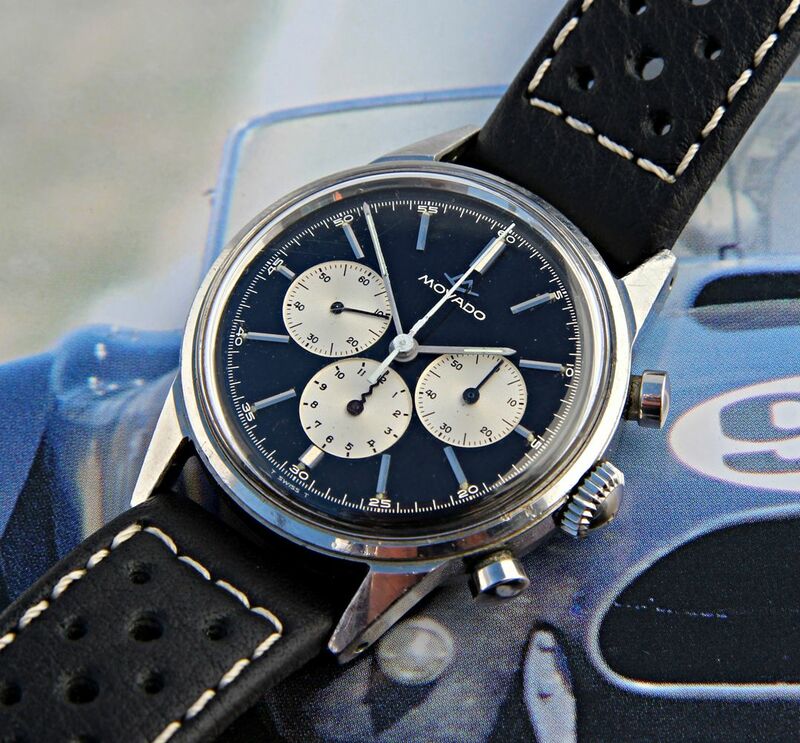 On this fascinating chronograph, the bottom pusher starts & stops the timer and the top resets it, a reversal from the usual chronograph operation and perhaps a result of the way the chronograph module is mounted towards the dial side. The operation of both pushers is crisp and firm and all counters reset to zero with firm finger pressure of the top pusher as they should. CRYSTAL: Older unsigned low dome acrylic crystal has some residual scratches from the years even after being polished but no chips, cracks or discoloration — Very Good+ to Excellent condition. 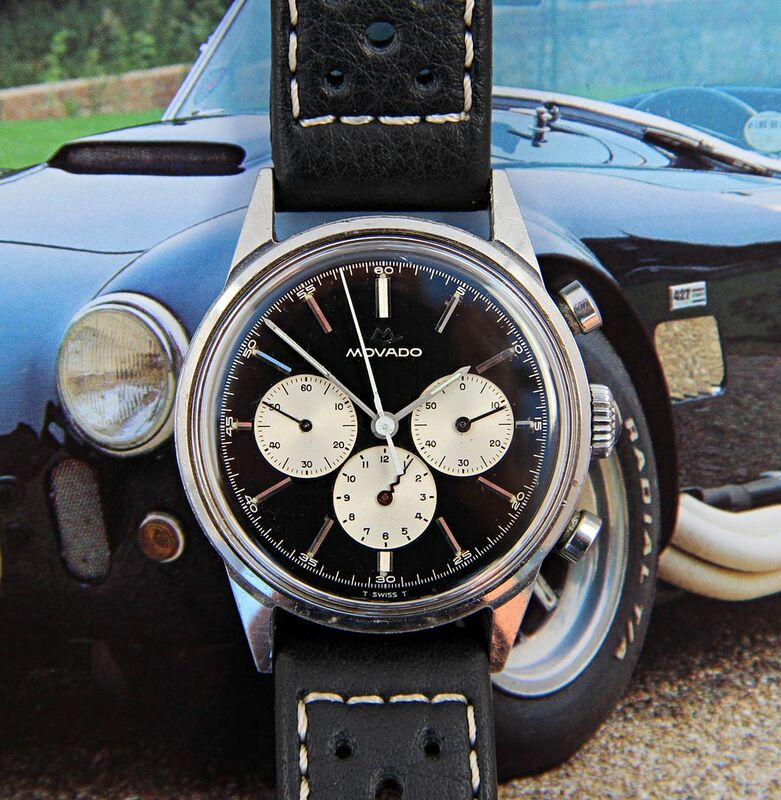 STRAP: This Movado comes on wonderfully fitting and gently used black leather Di-Modell rally strap with white contrast stitching and tons of life left to it. 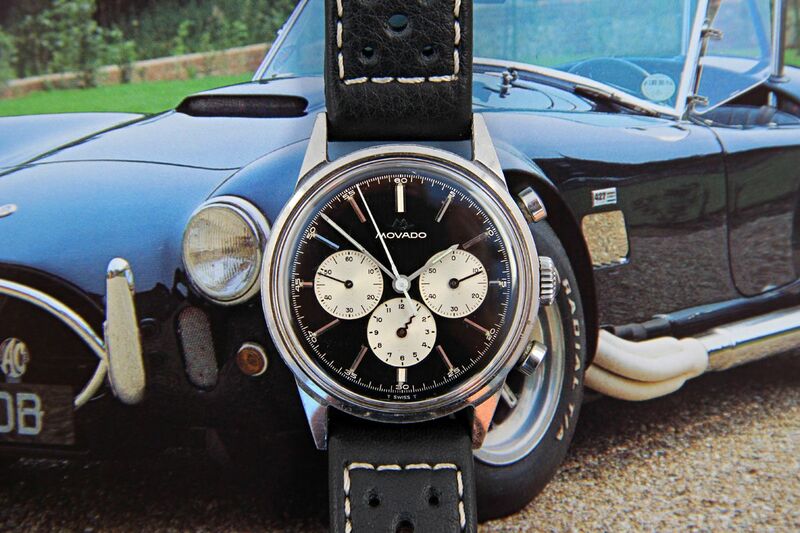 This classic Movado chrono has a lug width of 18mm. 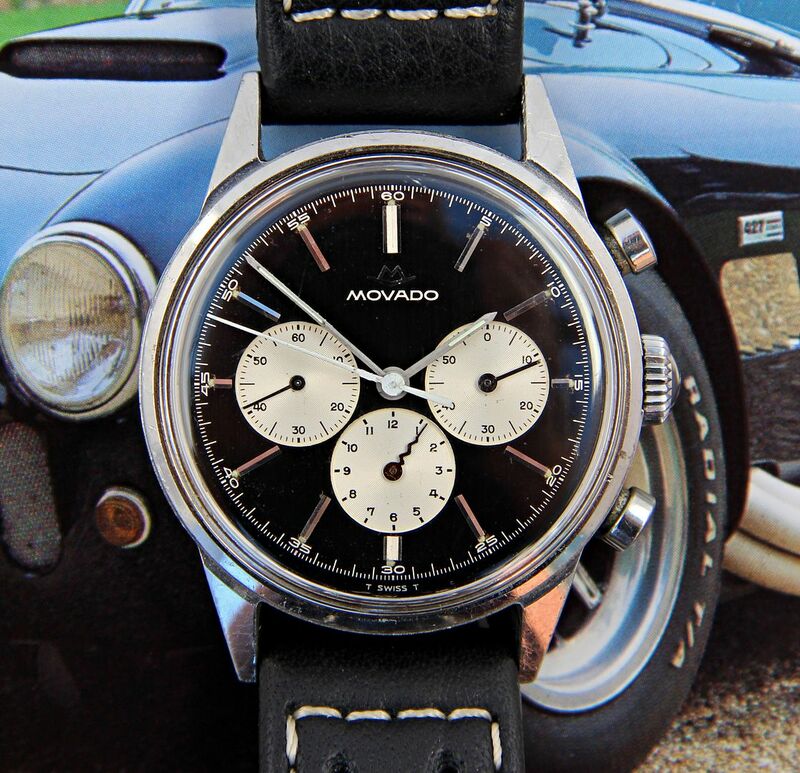 This great collector's Movado cal. 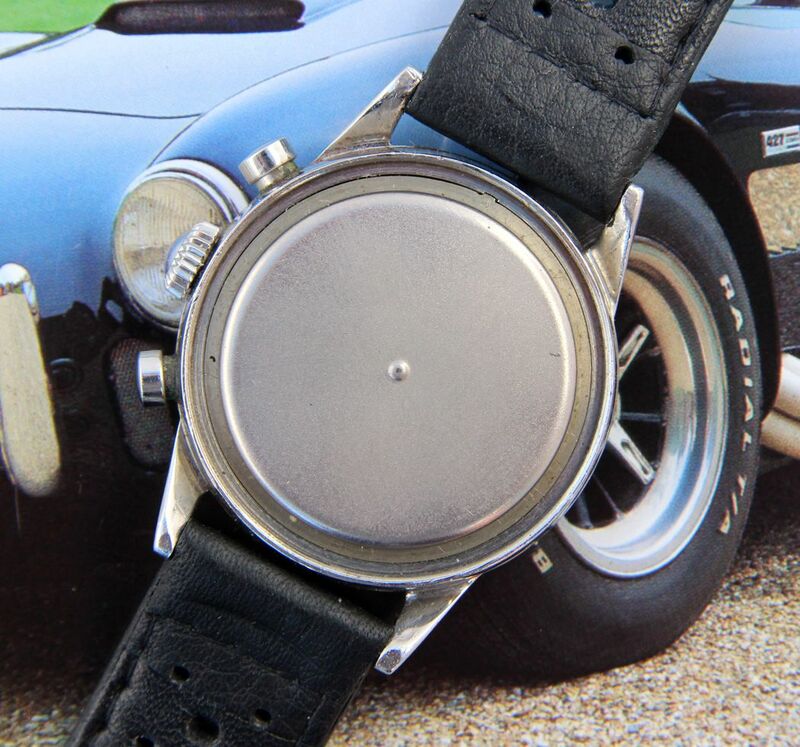 95M chrono is offered with a 3-day inspection period from the date of receipt and may be returned for a full refund (less any shipping costs incurred by the buyer). This refund is unconditional and once I get the watch back in exactly the same condition as it was sent to you, your money will be refunded. Of course, once the 3 days are over the sale will be considered FINAL.